CLAIMS OF breach of contract and accusations that officialdom is not doing anything to football in Trinidad were hurled at each other by Trinidad Football Association President Dom Basil Matthews and Hungarian-born coach Americo Brunner in statements here today as Brunner left his job as Trinidad National Coach. He flew home to Brazil after an eight-month-running battle with local football administrators. Brunner, who has been associated with the World Cup winning Brazilian team, declared that he terminated his contract on Tuesday after Trinidad officials by-passed him and chose a local coach to manage the team, now playing in Barbados. "The selection of Conrad Brathwaite as coach for the team in Barbados was the last straw. It was ridiculous. As national coach I knew nothing about it until I read it in the newspapers," he said. Brunner, 58, said he told Dom Basil Matthews on Tuesday that he intended to break his contract because he always found himself working under difficult conditions. He said Matthews seemed to want to rule everything. "After all these years the Trinidad Football Association (of which Matthews is also head) has done nothing for the game. It hasn't it's own football field or grandstand," he alleged. "This is bad. The association is making money but what use is it putting it to?" 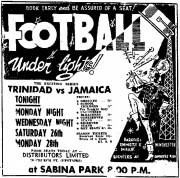 Brunner added that the standard of Trinidad football, already very low, would remain that way until its authorities decided to do something about it. Matthews in an embargoed statement given to the newspapers earlier in the week with the request that it should be published on the day of Brunner's departure, stated that Brunner had refused the execute the national coaching programme in accordance with the instructions and directions of a competent authority, the Trinidad Football Association. This, he said, constituted a serious breach of contract. "In these circumstances, I am obliged to terminate your contract immediately," Matthews told Brunner. Brunner, however, alleges that the national coaching programme was not properly organized.